Mike obtained his undergraduate and masters degrees in computer science and mathematics at Bristol, receiving no less than four awards along the way for his achievements. His final-year project investigated the use of GPUs to solve graph theory problems. His interest in computational molecular dynamics (MD) arose during a summer research project spent developing interactive high-performance algorithms for the Nano Simbox. 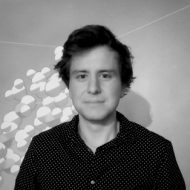 His PhD is funded by the EPSRC, and focused on accelerating MD simulations in high-dimensional systems, using virtual reality, hardware-adapted parallelism, and new sampling algorithms.